In ancient Greece, swords were just making the transition from bronze to steel. Old Greek swords kept the shape and size of early bronze swords, but smiths used superior iron to create the weapons. Although Greek swords were not actually steel, some genuine antiques show more carbon in the outer layers than in the core. Packing a sword in a mixture of ground bone and charcoal before the last heating creates a thin layer of steel around the iron blade. Today we call that case-hardening, but back then it was probably magic. 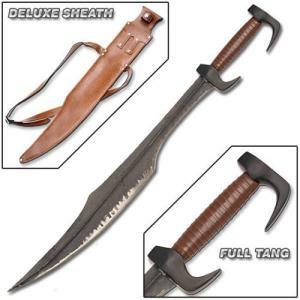 Today’s Greek sword replicas find their origins as much in movies as in history, but in style, our modern Greek swords do reflect important features of the old blades. The simplest Greek sword, called the Xiphos, sometimes measured two feet in length but evolved into shorter and still deadly versions by 500 B.C. The Xiphos served as a backup blade to the spear and came into play in truly close combat. Early swords of bronze performed well with a broad leaf-shaped pattern and a thick rib or heavy diamond cross-section. As iron replaced bronze, sword designs narrowed and lightened. Cavalry applications needed a different type of sword, and the Greeks developed blades with the curved scything shapes that later cultures refined. Made for cleaving and slashing instead of stabbing, the Greek Kopis included a hook-like pommel that provided a more reliable grip for that sweeping strike. The Kopis blade resembled the modern Gurkha Kukhri knife in blade shape and worked with the same irresistible axe-like action. A third type of Greek sword, the Makhaira, combined some of the features of the other two. Makhaira utilized many different patterns but often included a compound curve on the spine of the blade as well as the cutting edge. Mounted soldiers used either the Makhaira or the Kopis, but the Hoplite infantry fought with spear and Xiphos. None of the blade patterns used in ancient Greece was uniquely Greek. Greek smiths took concepts from Persian blades and swords from other European regions, acquired in trade or in battle, and added their own innovations. The Celt Iberian Falchion made by Windlass Steelcrafts embellishes the Greek Kopis blade with a beautiful hooked grip. The King Leonidas Sword transforms the Kopis concept into a brutal cleaver. For a practical bush knife with Greek style, consider the Ka-Bar Black Kukhri Machete.